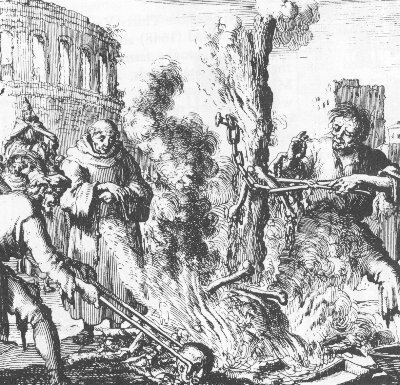 At some point in the first weeks of June 1155 — nobody knows the exact date, but it precedes June 18 — the Roman authorities disposed of Arnold of Brescia. For a decade the tongue of a fragile new Roman Republic, Arnold was a student of the cutting-edge theologian (and castrated romantic) Peter Abelard. Arnold held the temporal pretensions of the Vatican invalid, a theology sublimely according with the popular revolt that from 1143 overturned Rome’s overweening princes and even slew a pope in a melee on the Capitoline. The Senate long forsaken was re-founded by this new Republic and an equestrian order re-founded to resume to the rights of a now-growing middle rank. The slain pope’s successor became a refugee tenant of the neighboring cities, orchestrating crusades against Turks, Moors, and Wends — but dying at Tivoli in 1153 still awaiting a prince who would restore his own person to the authority of the Eternal City. That prince, however, had just begun to stir. The Hohenstaufen king Frederick I had concluded in the months before Pope Eugenius’s death a compact to restore the pontiff, which policy dovetailed nicely with an intent to show the German power against other wayward cites in Italy. It was Frederick’s Italian subjects, and conquests, who gave this man the distinctive name by which history recalls him: Barbarossa, or “red-beard”. Blending in the same discourse the texts of Livy and St. Paul, uniting the motives of Gospel, and of classic, enthusiasm, he admonished the Romans how strangely their patience and the vices of the clergy had degenerated from the primitive times of the church and the city. He exhorted them to assert the inalienable rights of men and Christians; to restore the laws and magistrates of the republic; to respect the name of the emperor: but to confine their shepherd to the spiritual government of his flock. Nor could his spiritual government escape the censure and control of the reformer; and the inferior clergy were taught by his lessons to resist the cardinals, who had usurped a despotic command over the twenty-eight regions or parishes of Rome. The absentee pope excommunicated Arnold in 1148. It was to no effect until Barbarossa’s legions neared the city. As King Frederick approached, Pope Adrian IV* applied a deft turn of the screw by laying Rome itself under an interdict, depriving his quarrelsome flock of both spiritual balm and pilgrim revenue and at long last forcing the heresiarch’s ejection. Arnold was seized in Tuscany and delivered to the Roman curia for punishment; the record of when or where this occurred is lost, but it is specified in the particular that his corpse was reduced to ashes that were scattered to the Tiber — proof against the prospect of a plebeian graveside shrine. Though Arnold had vanished into the Tiber’s silt, the thirst of his former flock for spiritual succor beyond that which the worldly Vicar of Christ could offer did not die so easily. Succeeding movements — indeed, perhaps, one continuous movement — took up Arnold’s objection to the clergy’s worldly emoluments and his summons to plain virtue. There are the Arnoldists to start with, but a bare few years after Arnold’s death emerge Peter Waldo of the heretical Waldensians, as well as the Cathars in southern France; a generation on finds St. Francis of Assisi, giving way to 13th and 14th centuries thick with oft-suppressed popular reform currents — the Beguines, the Apostolic Brethren, even the Fraticelli who criticized other followers of the aforementioned St. Francis for having already abandoned the poverty of his order. Later Protestants would claim all these, and Arnold too (Arnold reportedly opposed infant baptism), as their forebears, which is why we have the nice Colosseum’s-shadow picture above from Foxe’s Martyrs’ Mirror. Just how literally one should take that lineage might be a matter of debate, but there is little doubt that Arnold of Brescia’s critique maintained its potency into that era and keeps it still in the modern age — one reason that the incinerated firebrand could still make a powerful subject for a risorgimento writer like Giovannini Battista Niccolini 700 years later. * Born Nicholas Breakspear, Adrian remains to this day the only English pope ever. ** Popes and Holy Roman Emperors were most usually rivals rather than allies in peninsular politics; indeed, the Roman Republic had issued its own summons to Frederick’s predecessor to come to its aid — and rule Rome with its support — to humble the pretensions of the papacy. Arguably, Barbarossa missed a trick by not availing that potential alliance and instead exalting the pontifex maximus in the manner of his coronation: Barbarossa probably thought so himself often enough during his running rivalry over the ensuing generation with Pope Alexander III.